I performed my song SHE HATES ME at Harriet Schock's Songwriter's Showcase. Jennifer Losi performed my song START and Hillary Rollins performed our song EVERYTHING MUST GO. The other artists were phenomenal. Afterwards, most of us at ate at a restaurant across the street and chewed the fat until late. My writing partner Richard Castle and I had a reading of the first draft of our musical, OKLAHOMA IN WISCONSIN. 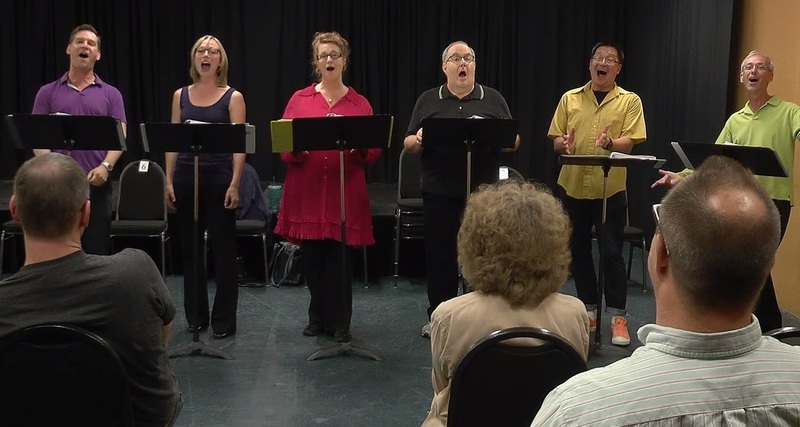 Elise Dewsbury, dramaturge for New Musicals, Inc., directed the reading which featured Peter Welkin, Christina Valo, Evelyn Halus, David Holmes, Tedd Szetto, and NMI director Scott Guy with Ron Barnett on the piano. The cast had only two rehearsals to learn an hour-and-a-half long show! In the words of one of our audience members, "You guys KILLED it!" Next, we wait for feedback from Jeff Herbst, the Creative director for Northern Sky Theater in Wisconsin who asked Richard and I to write it. Pat Whiteman sang Hillary Rollins and my song What Kind of Man Would I Be? at the Rockwell Table and Stage. I couldn't make it for I was still moving into my new place in Sherman Oaks. New Musical Inc.'s annual Got Musical event, showcasing pieces from a number of musicals they are helping develop, included Doing a Doo-Wop from Richard and my musical OKLAHOMA IN WISCONSIN. ​Maude Maggart performed Hillary Rollins and my song Everything Must Go at the E-Spot Lounge in Studio City. ​Staged Reading (tickets $10) of original musical by Richard Castle and I, Oklahoma in Wisconsin at 3D Theatricals in Anaheim.